In the early 1900s, Hjalmar Kallenberg – an engineer and a native of Uppsala – heads off to Italy to study hotels. Upon his return he purchases a building on the east bank of Fyrisån river, where he commissions construction of Grand Hotell Hörnan in line with European dimensions. 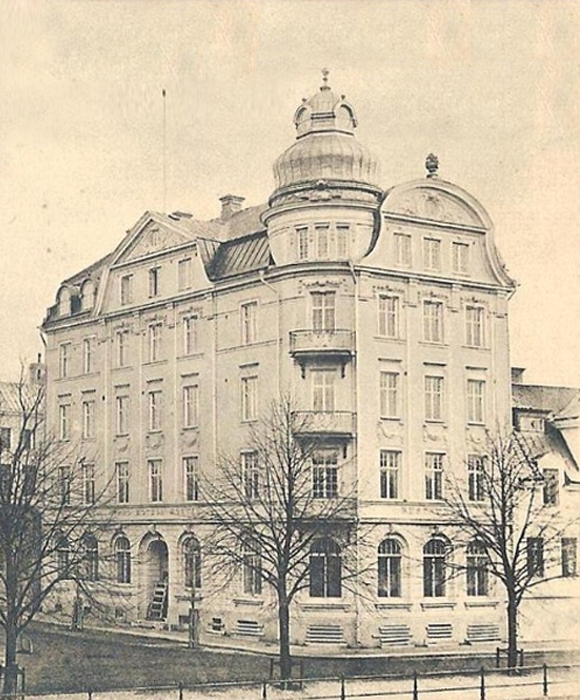 In late winter/early spring 1907, Grand Hotell Hörnan opens its doors, instantly becoming the biggest and most exclusive hotel in Uppsala with its 29 rooms. It is also the first hotel in Uppsala to have installed central heating. The hotel was designed by Ture Stenberg, the accomplished architect. The style is contemporary Neo-baroque, with a hint of Art nouveau in the décor. The façades are finished with plaster in light colours, with softly curved gables and rich ornamentation. The balconies feature beautifully shaped cast iron railings. The mansard roof and the tower section with its simple plastered decoration inspired by the principles of Art nouveau adds to the sense of splendour. During the first decade of the 1900s, trade flourishes in Uppsala and the market for hotels is large. In addition to Grand Hotell Hörnan, the city is home to establishments including Hotel Gillet, Stadshotellet and Rullan. In 1911, however, the city hotels face a time of crisis. The hoteliers therefore choose to team up to exploit the benefits of scale, and the company Uppsala Hotell AB is founded. In connection with this move, the hotel players jointly purchase a farm in Bärby just outside Uppsala to supply meat, eggs and milk to the hotels. In 1933, a certain Ms. Eriksson purchases the Grand Hotell Hörnan from the company. She subsequently marries and takes the name Andemo, and the hotel remains in her family for three generations. In 1999, the decision is made to sell the hotel to the Bennbom family, which runs Grand Hotell Hörnan to this day.